Keep running the race of parenting, life, and friendship even when you feel like you have nothing left to give. God will help you. He will hold you up and give you strength that you didn’t know you had because, guess what? It isn’t your strength. It is His strength being channeled through you for His glory. He will renew your strength, trust me. This week was tough both physically and mentally for me. To be honest, I actually cried several times over things that were frustrating, tiring, and completely out of my control. Things from work, home, relationships, and more all collided to create an exhausting week. As the week progressed, it became apparent that the weekend was going to be completely full of activities and visits from family. Beginning before I arrived home from work on Friday and ending Sunday afternoon, the house would be full of people I love and want to visit with. The problem? The week had been so draining that I had zero energy left to tap into and we had zero groceries in the house to feed the nine people who would be here at different times throughout the weekend. I was panicked when I realized how things were shaping up. I could see that I did not have time to run to the store before company arrived, but we had about a third of a loaf of bread, 6 eggs, some random items left from grocery store trips in past weeks, and questionably-still-fresh milk with an already passed date stamped on the carton. What did I do on Friday as I left work? To be honest, my first response was to begin to tear up and worry. I stopped that response almost immediately as it began to take shape. After that, I reminded myself that my guests were not coming here to see if I had amazing food, they were here to see us and watch our youngest daughter perform during her high school half-time show. They are all in the midst of chaos in Houston. A torn-apart house. Trash lining the streets. Displaced people and traffic all around. I’m pretty sure they could care less about the food and cleanliness of our house. I prayed on the way home. Prayed that God would help me remove the frustrations of the week at work, the mental and physical exhaustion I was feeling, and replace it with excitement and anticipation of the weekend ahead. Well, guess what? The prayers were answered on my short drive home from school. By the time I arrived home, I felt better and looked forward to visiting with everyone. They had even brought my cute niece as a surprise for my step-daughter! As the weekend played out, God helped me to lay aside worry about what to cook and gave me some ideas using the items we already had in the house. Semi-stale bread? We used it for toast with our eggs the next morning. Old potatoes? My mother-in-law made them into a yummy dish of creamed potatoes. 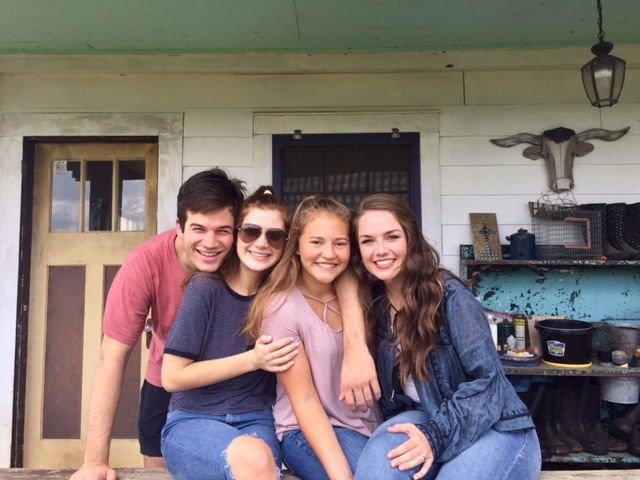 My son also ended up coming and bringing his sweet girlfriend, our youngest daughter ended up being able to spend the night with her cousin here, and then the next day, our oldest daughter decided to come visit us, too. Even with seven extra people here this weekend, nine of us altogether, I was able to make meals that were not fancy, but tasty and filling for everyone. I had spent a lot of time worrying about something that God already knew was under control. There have been times when we have been tired. There have been times when we have wanted to let frustration take over our thoughts. There have been times when we wondered if the time, money, and intentionality would ever pay off, but those thoughts are dissolving. They are dissolving and being replaced with something tangible. The tangible way our children love one another. The tangible feelings of comfort they find in one another’s company. *This was written about three months ago, but I was looking back over my blog and realized that I had never actually published this one. I truly hope it helps someone push through a difficult or demanding day. Keep allowing God to guide your steps and direct your thoughts. It is amazing the creative ideas, extra energy, and unexpected blessings He will bring your way if you allow Him to guide your plans. He will give you peace and curtail the feelings of exhaustion that are normal for a working mother at times. He is helping me to lay down recurring feelings of being overwhelmed with my demanding schedule and enjoy every possible moment with our three children, their friends, our family, and one another. I am grateful. Another great post and I have read it twice and passed along to my son and wife. Thank you for sharing and reminding me of what is truly important. Thank you so much, Scott! I really appreciate your comments and support concerning my blog over the years! I, of course, appreciate your friendship even more, though!